I will be at the West Texas Book Festival Sat. Sept. 24, in Abilene, with my book Alone and Alive: a practical guide for dealing with the death of your husband. If you are in the area stop by and see me. I was in Austin last weekend at an elder law conference. After driving down and checking into my hotel I headed out to have some dinner. I chose to eat a Chewy’s, a Mexican food icon in Austin. When arriving at the restaurant I discovered the wait was around an hour for a table. (After all the food is great and it was a Friday night!) I chose to sit at the bar, which offered full food service, rather than wait to be seated. As I sat at the bar, I thought about a friend of mine who isn’t comfortable eating out alone. She feels like everybody is looking at her and wondering why she is alone. Since an inflatable dinner companion doesn’t seem like a viable option, I spent my dinner time alternately watching some random sporting event on TV and thinking about how a new widow can deal with the discomfort of eating out alone. The first thing for every new widow to remember is that no one is wondering why she is sitting alone. They are all too busy thinking of their own problems to even be aware of the woman sitting alone in a restaurant. If you are unsure about this, look around you and see how many of those people seem more interesting that your own problems. None, right? I did find that sitting at a restaurant bar felt very different than sitting at a table. First you aren’t looking at all the other people, so you are not thinking about them. Second, at a bar you are usually sitting beside two other people. Nobody knows weather you are with people or are alone. (Of course they weren’t thinking about you at all, but if they had thought about you, it wouldn’t have been because you were alone!) Third, you don’t have to wait for an hour for a table with no one to talk to. Of course if you are still unconvinced, I suggest you bring an old sweater to drape over the chair across from you, giving everyone the impression that your dining partner has just stepped away. What ever you do, enjoy your meal! Alone and Alive was reviewed by the Midwest Book Review in their Aug. 12 issue. The easiest place to read it is on Amazon. Search by title and click on “see reviews”. It is the 2nd one. I will be at the Hill Country Book Festival in Georgetown tomorrow, Aug. 20. If you are in the area stop by and see me. I am having a book signing at the White Rhino Coffee Shop on Beltline in Cedar Hill on Monday Aug. 15, 2011. It is from 6:00 to 7:00. If you are in the area come by and buy a book, get the book you already have signed, or just visit. I look forward to seeing you there. Now what does pie have to do with being a widow? Last weekend, Thomas and I drove to Glen Rose, Texas, just to get away for the day. We enjoyed the rolling terrain and spent some time exploring the small downtown area. Then we found it. A shop named “Pie Peddlers”. They have homemade pies in an amazing variety of flavors and, of course, coffee or other drinks. We sat at the round table and took a chance on their pie. I had chocolate and Thomas had buttermilk pie. They were both really good. So good that we ended up taking a whole buttermilk pie home and it was as good at home as it was in the restaurant. So if you are ever in Glen Rose, Texas, stop by for some pie. But call and check their hours, they are only open three days a week. So what does pie have to do with widowhood? Maybe, it is just more evidence that you can be happy again after your husband’s death. You may be Alone, but you are Alive. Or maybe, sometimes, we just need pie! Presnell, Romaine, A Journey Through Widowhood, Centering Corporation, 2004. This short book follows psychotherapist, Romaine Presnell’s, journey from grief to happiness following the death of her husband. The book is excerpts from her journal and is easy to read. It expresses her emotions and questions which were instantly recognizable as feelings and questions I had after the death of my husband. Ms. Presnell express her feeling of uncertainty, pointing out that she was neither young nor old when she became a widow. Perhaps the most striking thing about the book is her honest portrayal of the questions she asked as her emotions changed. Her journey clearly illustrates many of the expected reactions, from emptiness to anger, that the new widow feels. But perhaps the best message the book provides is one of hope. We see the author emerge whole and happy following her long journey through grief. It is a journey I can identify with and an ending I recognize also. I have emerged from my grief whole and enjoying life, as has the author. I can highly recommend this small book to anyone who has lost a spouse. I provides the reassurance we all need that the sadness is normal and that it won’t last forever! Thelma Zirkelbach writes a blog entitled Widowsphere: A circle of Hope, which provides poignant insight into her own journey as a widow. She published a review of my book, Alone and Alive, several weeks ago. Sunday, July 16, she ran a brief interview with me, discussing how the book came into being and some of the issued I faced as a new widow. If you are interested in reading the interview, go to www.widowsphere.blogspot.com and check out the July 16, post. Just when I thought nothing could surprise me and make me cry, my emotions ran out from behind a tree and mugged me. I was continuing to clean out the large closet in my den and opened the box of papers. In the middle of the box was an envelope from Bob's employer. It contained e-mail messages from across the country. These messages, sent to his employer, expressed not only condolences, but also discussed Bob's many wonderful attributes, including patience, kindness, and his chronic cheerfulness. I had not read these e-mails before and decided that my son, Thomas, would enjoy hearing them. I began reading them out loud. As I read, tears began to well up, as I recalled all of Bob's good traits, the things about him that attracted to me to him in the first place and kept our marriage strong. Suddenly, I missed him tremendously. It is in those surprise moments that we realize that grief is never fully gone, but we can go on to live joyous, full lives alone. Be patient with yourself, and remember, it takes time to heal. Thomas and I were driving to New Orleans to display my new book, Alone and Alive, a practical guide for dealing with the death of your husband, at the American Library Association conference, when we began discussing family history. Among the stories I told was one my Mother had related to me about her childhood. My Mother and her father began going to the “cowboy movies” every Saturday night when she was still a very young child. When the weather was good they would walk the few blocks to the theater in the town square. It was a special bond that developed between them as this pattern continued even into Mother’s early teens. Then came a Saturday night, when Mother was 14, that changed that. Mother was invited to a sleep over with friends. At an age where teens begin to separate from the family, she chose to go to the sleep over, rather than the cowboy movies. Her father’s feelings were hurt, his little girl wasn’t going to the movies with him. At 5 in the morning Mother was awakened. Her mother had come to take her home. The unthinkable had happened, her father had a heart attack and died. Mother was hit with terrible guilt! At 14 she believed that her father had died of a broken heart! Guilt is a part of grieving. Of course, as an adult, my Mother understood that her father did not die of a broken heart, and that her decision did not cause his heart attack. But for nearly all of us there is the opportunity for guilt - “if only I had...”, “The last thing I said was....”, and many other. Just remember the only thing you can do with guilt is learn from it. Treat you family as if you might never see them again. Don’t give guilt an opportunity. Father's Day is a hard day for many of us. Both my father and my husband are gone. I hoped it would drift by unnoticed this year. Unfortunately, Thomas and I went to the bookstore yesterday. “Why is there so much traffic,” he asked. “Is it? I didn’t realize that.” Thomas replied, somewhat startled. We glanced at each other, as we sat in the line of cars trying to find a parking place. Our eyes conveyed the same sentiment. Neither of us really wanted to think about Father's Day, but we couldn’t escape it. No Father’s Day celebration today, just an ordinary Sunday. For all the Fathers out there, enjoy your family, hug them a lot, make the most of your time together, and, of course, Happy Father’s Day! The type of property you own, your family makeup, and where the deceased wants the property to go are all issues that effect the decision to probate a will. There is no easy, one size fits all answer to that question. In Texas, if there is no will, the deceased property may go to his children instead of his wife, if he has children outside the marriage. That could leave you owning you home with your step-children! Each case is different, you need to consult a qualified probate attorney to determine if your spouses will needs probating. Yesterday my son and I were on the highway and Thomas was driving. He periodically went “weeeeeeeee,” like a kid on a ride, as we came down a steep ramp. About the 3rd time he did this I had to laugh. My husband used to make the same sound especially on switchbacks in the mountains. Thomas was to young to have learned the behavior so I can only assume it is an inherited part of his personality. Widows often find themselves reminded of their deceased husbands in the action and mannerisms of their children. Depending on where you are in your grief the reminder can be painful and bring tears, or it can bring a smile. Coming up on the ten year mark, this expression of driving enjoyment made me laugh. I remembered all the great times Bob and I had traveling together. I have to show Thomas the vacation video that demonstrates Bob’s “weeeeeeee” and the two of us can laugh together! Memorial Day is viewed by many of us as the beginning of summer. We see the promise of long lazy days, cookouts, swimming and camping. The promise of something more than the winter cold. I confess to spending time with my family and enjoying a day off from work. But this year is a little different. My in-laws are camping and my son is in France on tour with the Austin College A’Cappella Choir, so I am alone. It is one of the changes that comes with being a widow. While being alone on a holiday is viewed b y many as sad and lonely, it hasn’t been for me. I have taken the time to reflect on the meaning of Memorial Day. I have reviewed all the gifts I have as a result of the men and women who chose to serve our country. Though I am a women alone, I have the ability to support myself and am not forced to live off the charity of others. I have the right to vote and make my voice heard. I have abundant freedoms which I hold dear because there have always been brave people who defended those rights. The transition from couple to single is hard (see Chapter 7 of my book, Alone and Alive,) but I am grateful for those who fought to provide me with a safe future. Thanks to all the men and women of our armed forces, past, present and those yet to come. It has been almost ten years since I became a widow. Those years have bolted by in a haze of grief and recovery, activity and stillness, stagnation and growth. And here I stand, almost at the ten year mark, faced with yet another tangible reminder of my life with my wonderful husband and his complete lack of organizational skills. I spent my Easter weekend cleaning out a large storage closet (with time out for Easter services). As I went through the boxes and bags containing papers dating back as far as two decades, I found myself filled with mixed emotions. The receipts, church papers, paid bills, and bank statements were a reminder of my “normal life” that is gone forever. As I threw out the trash of many years (carefully keeping the documents I need) I felt a sense of being in control of my life. I once again had an affirmation that though I am alone, I am very much alive and in control of my “new normal” life. Unfortunately, I haven’t finished the closet yet, but I will. Who knows what memories I may uncover in those boxes? 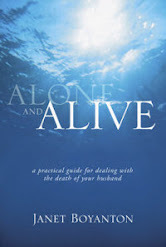 My new book, Alone and Alive, A practical guide for dealing with the death of your husband, is due to be published May 31, 2011. It can be pre-ordered through barnesandnoble.com.